Did I mention I am totally overdue to get my hair done? #MessyHairSortOFCare ;) I’m only 3 months out since my last appointment, but I need to go book that appointment STAT if I want to look hot for my upcoming Valentine’s date! ;) Who has FUN plans for Valentine’s Day? As the big day is getting closer and closer, I am getting so excited! So, earlier this week was the debut of our eye lash heart banner. I’m still on cloud 9 from all the wonderful feedback and shares. You guys sure know how to make my day even brighter! 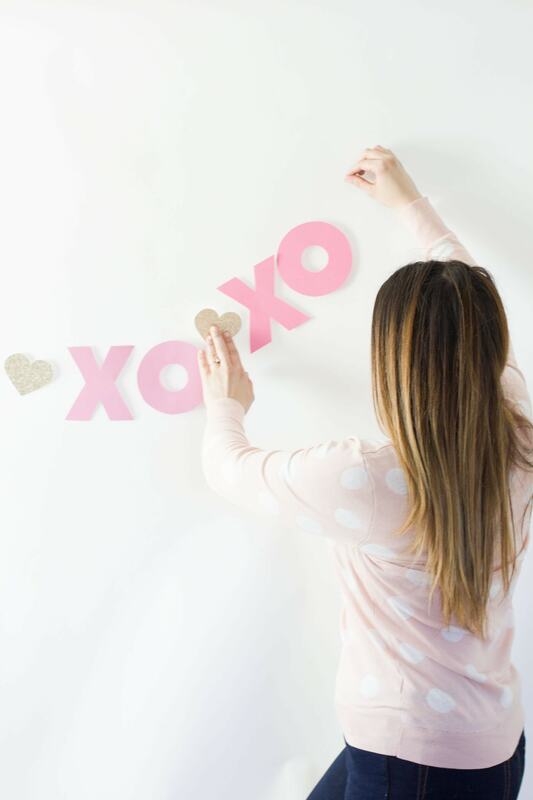 This week, we’re talking all about the XOXO theme! When designing this, I told our creative team to get “J.Crew” colored construction paper. I couldn’t believe how easy it was for us to make. It took 30 minutes between the two of us. A little construction paper, stencils, and fishing line goes a long way friends! Okay, back to dreaming up more new projects that I can hardly wait to share with you. This week we’re going to Rick’s Dessert Diner to have our team “Cake For Breakfast” Valentine’s party, and I can hardly wait. Bring on the sprinkles!!! My parents were supposed to babysit but Charlie keeps asking if he can come. How do I say no to that?! Since he won’t have school that day, I think I am going to just cave. ;) Stay tuned on my Instagram story to see if Charlie crashes the party after all. ;) To be continued! 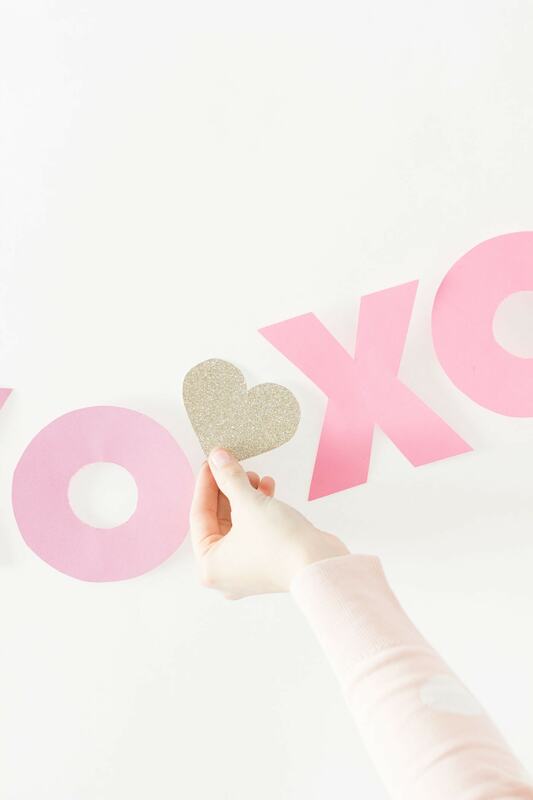 Trace the “X” and “O” stencils on each piece of paper and cutout. 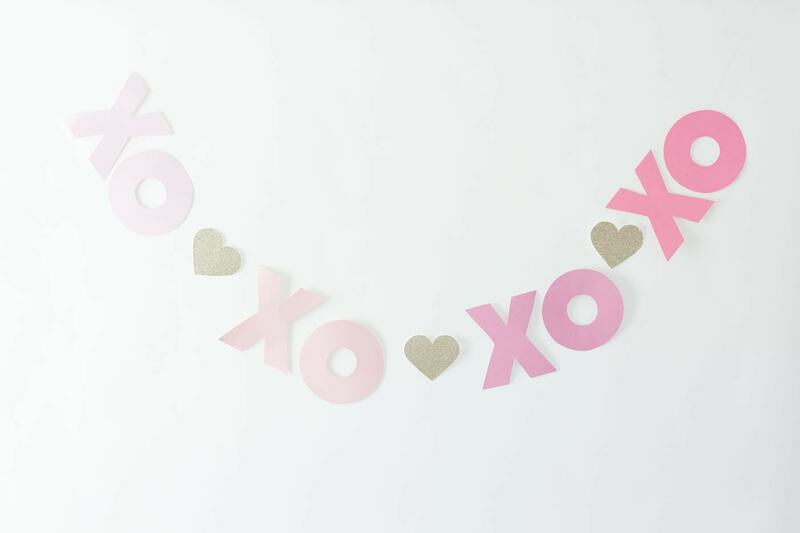 Cut a heart shape with the gold glitter paper. 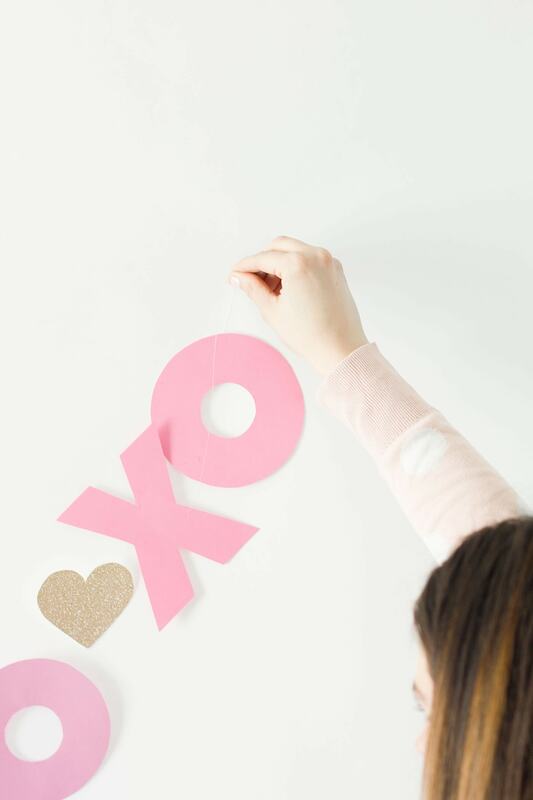 Hot glue your Xs and Os in an ombré pattern onto the fishing line, adding a gold heart after each pair.